Apple provides a simple solution for its users to backup their devices wirelessly. Apple's iCloud is a cloud-based service that stores information uploaded by users from their iPhone or iPad. You can backup purchased history from music, movies, apps, TV shows, photos and videos from camera roll, iOS settings, home screen icon layout and folders, ringtones, messages etc. Nonetheless, iCloud is incapable of backing up already stored content such as bookmarks, contacts, reminders, notes as well. 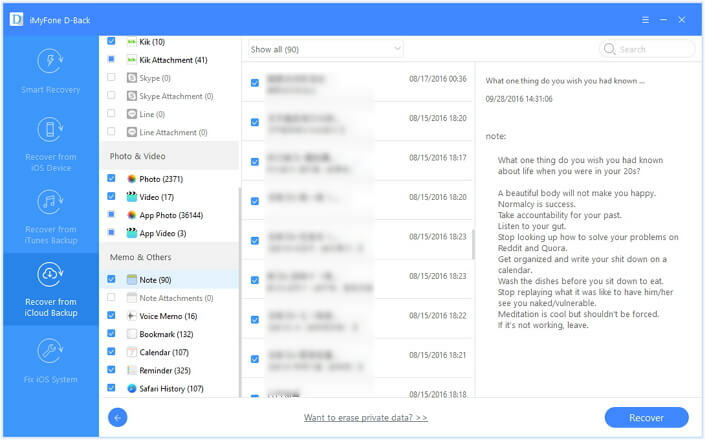 If you deleted some important notes, you may have 3 possible ways to get them back. One is to check the "recently deleted" folder in iCloud.com. The second one is to restore your iCloud backup. The last but not the least is to use a professional iPhone data recovery to recover deleted notes from iCloud easily. Although iCloud can back up notes on your device, there is no way to preview or access them when you restore the backup. Restoring from iCloud will replace all the existing data on your device. 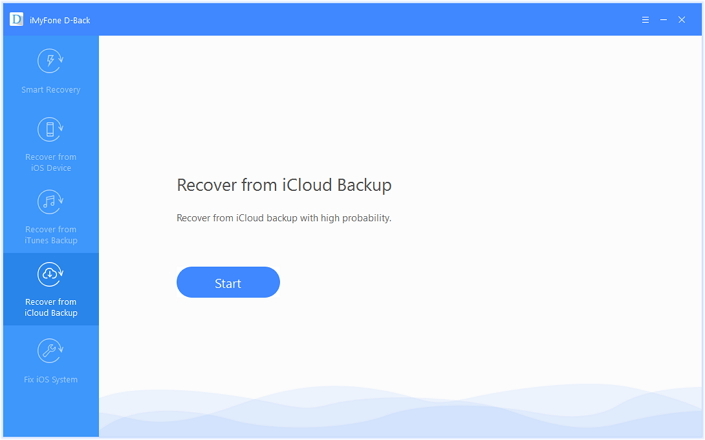 If you don't have a backup or you have confirmed the data you need is not in the backup, you need a tool like D-Back to recover directly from the iPhone or to view your iCloud backup. We therefore recommend that you don't restore the full back up to your iPhone since you risk losing all current data on your device. The preview option of D-Back enables you to view important files that you wish to recover to computer. iMyFone D-Back functions efficiently in the recovery of data from iCloud backup in simple steps. It allows you to view your notes within iCloud backups before recovering. There is no data loss via using it to recover notes from iCloud. There is no storage limitation. You can selectively choose the notes you need to recover. It even recognizes third-party obligations, making it easy for the user to retrieve by selecting over 18 different file formats. Compatible with iPhone XR/XS Max/XS/X/8/7/6s/5s/4 running iOS 7/8/9/10/11/12. Visit the iMyFone D-Back site to download the trial version of Windows PC or Mac. After installation, launch the program. From the primary interface, choose "Recover from iCloud Backup" feature from the left pane. Press the start button to select the file format that you wish to retrieve from the next screen. Choose "Notes" and then "Next". Sign in to your iCloud account. It is important to allow the program to access your iCloud account to search for available backup files. Once you log into the account, iMyFone D-Back will scan for available backup files and lists them in order. You will also see the file size along with the date of creation of the backup. From the available list, you can choose the preferable backup file from which you wish to recover the notes. After making the selection, press "Next" button at the bottom of the window. iMyFone D-Back will begin scanning for the selected iCloud backup file. Upon completing the scan, it will display all the recoverable data from the backup in its preview window. It automatically categorizes the data under different sections. You can even see only the deleted files by selecting the "show only deleted files" option. From the list, choose the files that you wish to retrieve and save to your computer. Click on "Recover" after selecting the Notes you need. iMyFone D-Back will begin extracting the selected files from the backup file. After completion, it will prompt for you to choose a location where you would like to save the files. Select a folder on the hard disk or create one. Wait until the program completes the process of recovery. You can later browse the destination to check for the retrieved files from the selected iCloud backup file. Step 1. Sign in to iCloud.com and choose the notes application. Step 2. Choose "Recently Deleted" folder and search the notes you want. Notes in this folder are permanently deleted after 30 days. Step 3. Click "Recover" to recover the deleted note. You can find the recovered notes in "note" folder. If you want to restore backup from iCloud including notes, the first thing you need do is to check whether you have a recent backup. The Notes on your iPhone like Mail, Contacts and Calendars are often stored “in the cloud” (a sever linked to your email address). 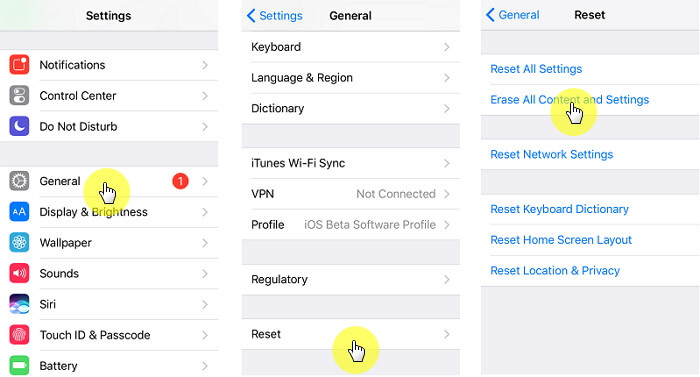 Step 1: First go to Settings > General > Reset > Erase All Content and Settings. This should take you to the setup screen. Step 2: Follow the setup assistant prompts until you get to the Apps & Data Screen. Here, select “Restore from iCloud Backup”. Step 3: Sign in to iCloud and select the most relevant backup. Then stay connected to the Wi-Fi network until the process is complete. 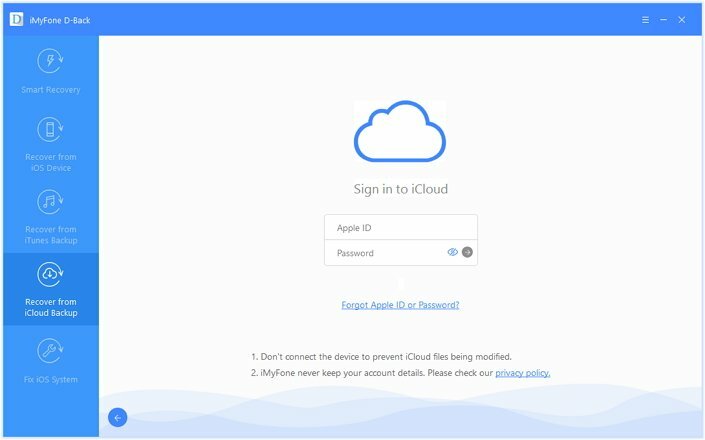 iCloud offers users a free way to backup and restore data to their iOS devices. 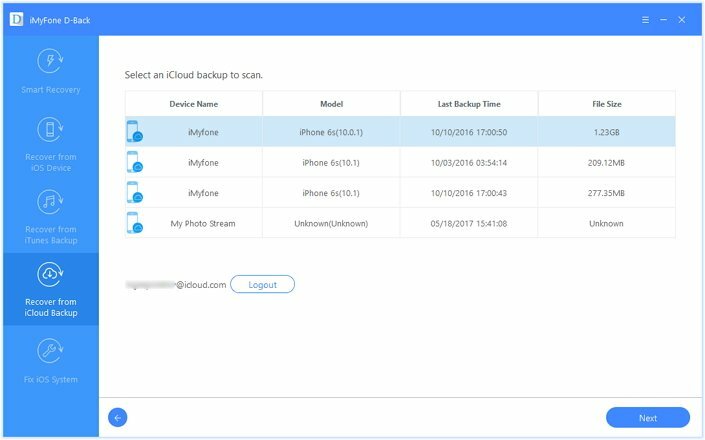 With iCloud, you can get the data back on your iPhone quickly and easily as long as you have a recent backup. But, iCloud may fail to back up all the data on your device if you haven't upgraded your iCloud storage plan. In contrast, iMyFone D-Back is not free, but there is a free trial version that you can use to view the backup before recovering. Once you are certain the backup contains the data you need, you can then purchase the full version to recover. 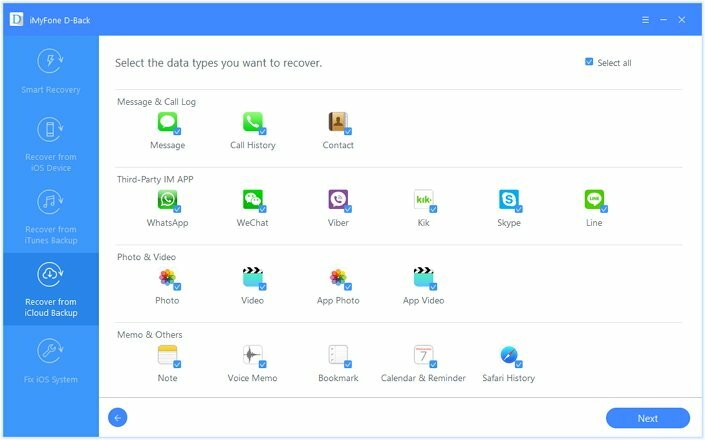 D-Back also makes it possible for you to selectively recover data and supports the recovery of various types of data including messages, photos, videos, call logs, WhatsApp, Kik, Viber and so many more. It will not cause data overwriting. Download iMyFone D-Back iPhone Data Recovery Win or iPhone Data Recovery Mac to give it a shot. iCloud Could Not Restore Backup to iPhone Xs/Xr/Xs Max, How to Fix?